Mothers and fathers when your depression or anxiety symptoms begin to impact your daily living here are some tips on taking care of yourself and informing your daughter of the changes. You can’t pretend everything’s OK when it’s not. If your depression has you napping more than usual, or not doing the things you usually enjoy, chances are those around you recognize that something is wrong, even if they haven’t said anything. If you experience anxiety, your daughter has probably noticed that you don’t participate in some activities that her friends’ mothers seem to embrace. It’s natural for your daughter to have questions about what you’re experiencing and why. She may wonder whether she did something wrong or whether you’ll harm yourself. If she doesn’t have answers, she may invent them — and her imagination may be much worse than the reality. When depression causes you to change your routines or anxiety affects your choices, letting your daughter know what is going on may help ease her worries by keeping her from imagining the worst. Assure your daughter that what is happening to you is not her fault and that you still love her. Tell her that she should feel free to share her concerns and that you will try to answer her questions as well as you can. 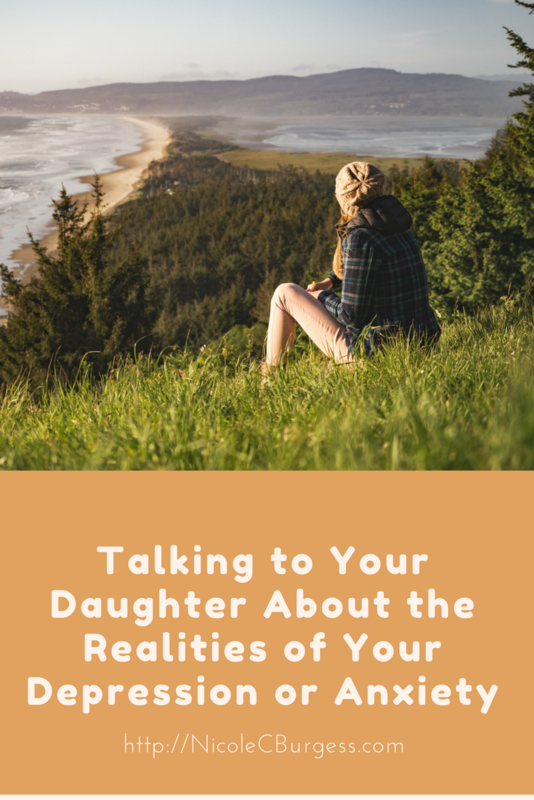 You’ll want to walk the line between answering your daughter’s questions and not giving her more information than she can handle. A lot will depend on her age maturity level. If she’s a teen, you can talk about your moods. If she’s very young, she may only need to know that sometimes you need to rest. If you’re not sure how much to tell your daughter, your therapist can give you some tips. You may also want to consider getting some counseling for your daughter, so she has a safe space to share her concerns and feelings. Nicole Burgess works with teen girls and women in overcoming anxiety, perfectionism and rediscovering joy. She offers both office and online therapy sessions for Indiana and California residents. She is also a life coach for mothers of teens wanting to break free from the myth of being a perfect mom and embracing her divine feminine.